Ed Kirrane, above all others, personifies hockey in Brookline. All-star player, revered youth and high school coach, founder and long-time president of Brookline Youth Hockey — Ed has been the heart and soul of hockey in Brookline for more than 50 years. Growing up in Brookline, Ed learned to skate on the pond at Larz Anderson Park. He was a varsity hockey player at Brookline High School from 1950 to 1953 and was captain in his senior year. That team reached the final game of the state tournament, playing in the old Boston Garden against Malden Catholic. At 1:00 AM, after two overtimes, the teams were tied. They returned the next night to play the third overtime, with Malden Catholic finally scoring the winning goal. Ed played hockey at Boston University. Later, he was a member of the U.S. national hockey team from 1957 to 1959 and was cocaptain in 1958. Ed's brother, Jack Kirrane, was captain of the gold-medal-winning 1960 U.S. Olympic hockey team. Ed played amateur hockey in Masschusetts until 1972, winning a national championship with the Rockland Estes team in 1962. Ed began his transition from player to mentor just after college. In 1960, to "take up where the Brookline Recreation Department's budget left off," Ed founded Brookline Youth Hockey. Ed served as BYH president and coach for 40 years. During Ed's long tenure, BYH grew into the successful program it is today, combining instruction for young children with league play through Midget level. 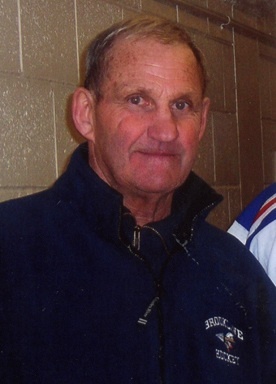 Ed was succeeded as president in 2000 by long-time treasurer Bob Monahan, but Ed has continued to coach BYH Midget teams. As if he weren't contributing enough with youth hockey, Ed took up a career as high school hockey coach, beginning at Don Bosco Technical High School from 1968 to 1981. Three of his teams were league champions, and one reached the final game of the state tournament. He then spent 20 years coaching at Walpole High School, with two teams winning league championships. In 2001 Ed returned to his roots, becoming varsity hockey coach at Brookline High School. Since then, Ed has focused on coaching high school students both at Brookline High and in the BYH Midget program. Many young players have known Coach Kirrane in yet another role — as director of the summer Dexter Hockey Camp since 1974. At the Dexter camp, Ed and his coaches combine instruction and hard work with an unending commitment to making hockey fun. The Kirrane Cup, the camp championship trophy made from a plastic water jug, exemplifies the lighthearted spirit that Ed brings to his coaching. It is impossible to think of youth hockey, high school hockey, or summer hockey in Brookline without thinking of Ed Kirrane. Without Ed, none of these programs would exist as we know them today. Ed has been the motive force and the ever-present guiding spirit. Learn the basic skills of hockey to the best of your ability and the rest will come. Hockey is a sport that teaches great individual skills, and it is important that you learn at the same time to be a team player, always giving 100 percent. Work just as hard at practices as at games, and these skills will help you to be a better person in your life, never giving up, always ready to learn something new, and most important of all, taking pride in being the very best that you can. Most important of all: hockey should be fun!